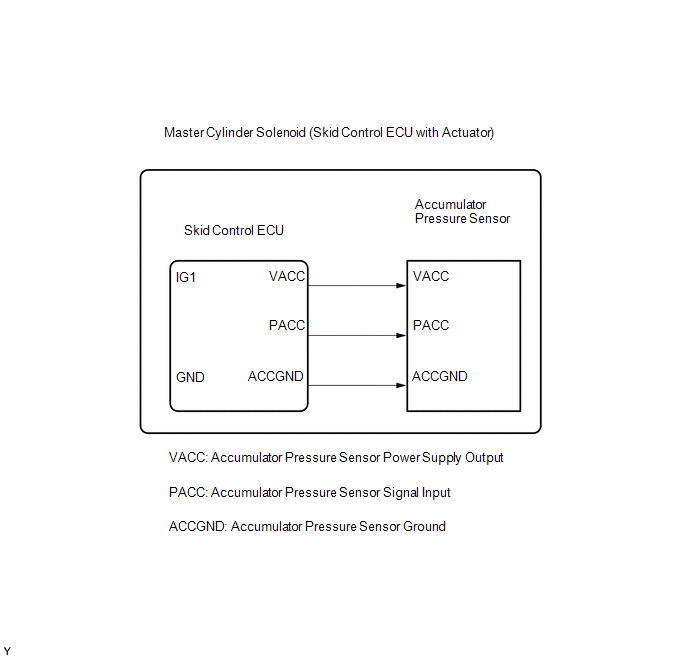 The accumulator pressure sensor is connected to the skid control ECU in the master cylinder solenoid. (Fluid pressure does not change when it should e.g. pump operates, brake pedal depressed/released). (e) Select the Data List mode on the Techstream. (f) Confirm whether the accumulator output voltage is normal. (a) Turn the ignition switch to OFF. (b) Depress the brake pedal more than 20 times. (c) Install a brake pedal effort gauge (SST), and bleed air. (d) Connect Techstream to the DLC3. (e) Turn the ignition switch to the ON position. (f) Select the Data List mode on the Techstream. (g) Check that the master cylinder output value is in the Normal Condition range. Master cylinder pressure sensor value is in the Normal Condition. (f) Depress the brake pedal and release it. (g) Wait for 25 minutes. (h) Check if the same DTCs are recorded.